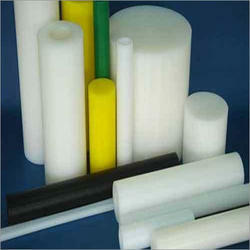 Manufacturer & Exporter of Nylon Rods & PTFE Rods. Our product range also comprises of Silicone Gaskets, Silicone Rubber Tubings and Anti Vibration Pads. Manufacturer & Exporter of Nylon Rods. Our product range also comprises of Silicone Gaskets, Silicone Rubber Tubings and Anti Vibration Pads. PTFE (Polytetrafluoroethylene) ram extruded rods are available in standard meter lengths and in diameter ranging from 6 mm to 100 mm. PTFE compression moulded rods available from 12 mm diameter to 300 mm diameter in 300 mm diameter. PTFE ram extruded tubes are available in outer diameter size ranging from 25 mm to 150 mm with wall thickness 3 mm and up. PTFE compression moulded tubes are available from 20 mm outer diameter to 300 mm with wall thickness 5 mm and up.